Winter wedding decorations are special as they make everywhere sparkle and add an extra touch of magic to your ceremony, tables and wedding reception. Decorations for winter weddings are everywhere during the Christmas season and there is no need to belong to a particular religion to take advantage of the thousand and one winter wedding decorations available. The available Christmas decorations can double up as winter wedding decorations. Winter is that time of the year when people seem to be at their most festive mood. It is a time of joy and celebration that a lot of couples choose this particular season to tie the knot. If you have plans of booking your big day during this wonderful time of the year, plan way in advance. Here's one idea. 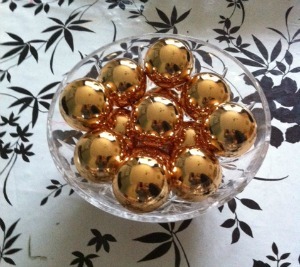 Buy Christmas decorations and baubles on clearance sales. 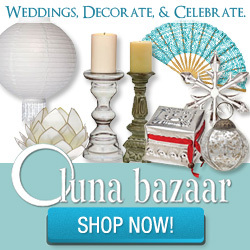 Wait for the post-Christmas season and buy your wedding decorations at rock-bottom prices. You need not be limited to post-holiday sales so watch out for stores clearing out themed items at bargain prices too. 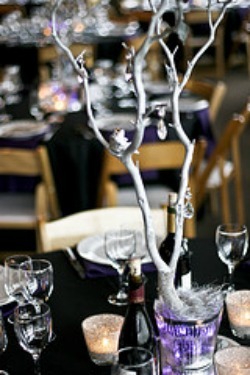 Here are some easy and inexpensive winter wedding decoration ideas. Set up a real live pine or fir tree in the reception hall. You can decorate it with Christmas trimmings that are in synch with your wedding motif. If your color motif is red and gold, by all means fill the tree with red and gold decorations. If your motif is silver and blue decorate the tree with the said colors. Decorate the ceiling and walls with boughs of holly or swags of creamy tulle inter-twined with silk poinsettia. Set a large foam ball in the middle of the function hall and stick in branches of pine or fir and silk poinsettias for a big hanging ball topiary. Attach lengths of 6" tulle to radiate from the hanging ball topiary to the sides of the wall, minimum of four lengths for the four corners of the function hall. Adjust the number based on the room's size. If you are not keen on a Christmassy theme, then opt for a magical winter wonderland theme. Buy some clear white and silver plastic snowflakes and hang them from the ceiling. Get dried tree branches (preferably willow) and spray paint them white. Add some silver glitter paint on parts of the painted tree. Get some buckets, one for each "tree". Set the tree in the bucket and fill it up with sand and some flat stones to keep the tree from wobbling. Cover the bucket's exterior with gold or silver fabric, gather them up at the rim and secure with a 2-3 inches wide ribbon finishing with a bow. Make use of fairy lights and string them throughout the branches. Place the twinkling trees throughout the room making sure there is provision for electrical power for the lights.